The Palladian Traveler is proud to welcome Mark Masone into the stable of Good Chefs. 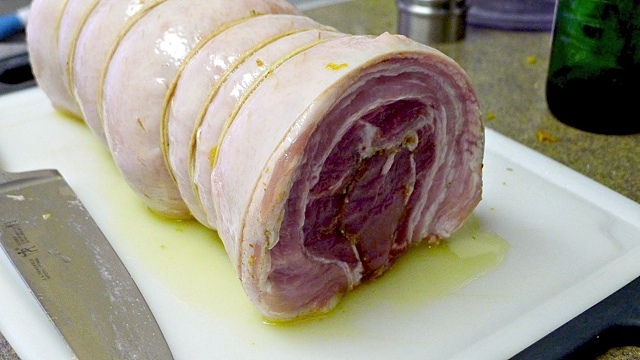 Mark’s first offering is his take on the traditional Italian pork dish, Porchetta. 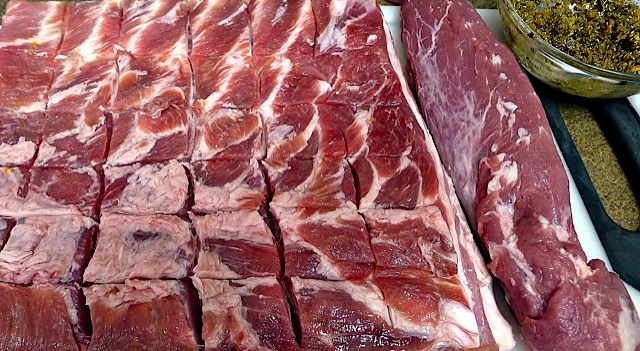 Along with the recipe, Mark provides us with step-by-step visuals so that we can virtually smack our lips. Before we head into the kitchen, tie on the apron and roll up our sleeves, let’s meet the man behind this mouthwatering dish. Mark grew up in a small town in southwest Virginia and attended and graduated from Virginia Tech. It was there, at college, when he started his culinary apprenticeship at a local gastropub alongside his Italian restaurant owner-mentor. After finally mastering the art of making a roux and cubing mire poix to perfect dimensions, the owner allowed him into the inner circle and taught Mark the art of using fresh ingredients, some heat and lots of elbow grease to bring the pub patrons back to fill their bellies. Cooking is really in Mark’s DNA, as his older brother attended culinary school and is a professional chef. Sibling rivalry aside, big brother has had a direct influence on Mark’s passion for food – preparing and devouring. Mark’s attended culinary classes in Washington, D.C. and Rome, Italy, and, when time permits, he works his magic on the cooktop, in the oven or out on the grill. He’s also an amateur bootlegger, brewing his own homemade beers. When not in the kitchen honing his culinary craft, he keeps a pretty busy schedule with his “day job” as a consultant for Deloitte in the District. 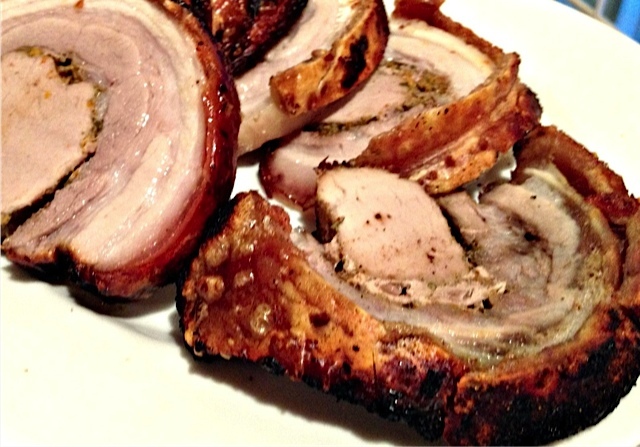 Porchetta is a traditional Italian boneless pork roast. 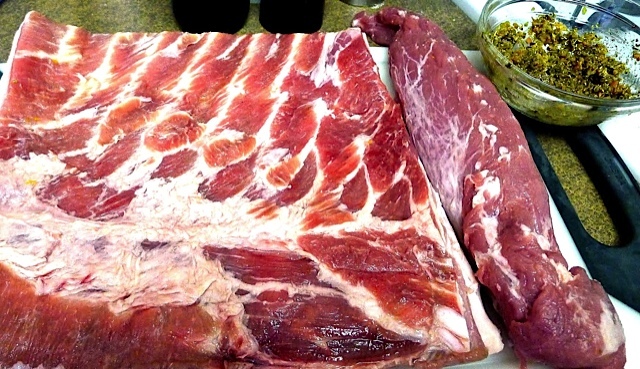 Sorry to be graphic, but the body of the pig is gutted, deboned, arranged carefully with layers of stuffing, meat, fat, and skin, then rolled, spitted, and roasted, traditionally over wood. Porchetta is usually heavily salted in addition to being stuffed with garlic, rosemary, fennel, or other herbs, often wild. Porchetta has been selected by the Italian Ministero delle Politiche Agricole, Alimentari e Forestali (Ministry of Agriculture, Food and Forestry Policies) as a “prodotto agroalimentare tradizionale” (Traditional Agri-Food Product), PAT for short. Porchetta is one of a list of traditional Italian foods to have cultural relevance and is most popular with Romans who enjoy any excuse to head for the Castelli Romani and partake. Now that we know what Porchetta is, let’s gather in the galley with Mark and see how he prepares his version. 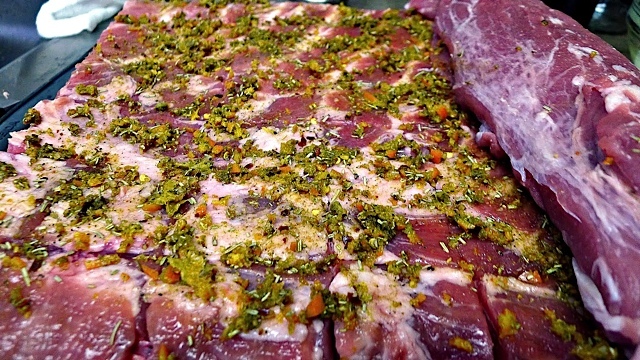 Step-11: Following the cold storage period, you’re now ready to roast the Porchetta. There are two roasting options from which to choose. Option-1 is to roast slowly then high (recommended if you have the time), or Option-2, roast high, low, then high again (quicker roasting method). We’ll explain both. Slow-Low method: Salt the roll, introduce into oven at 250-dgrees F for two hours. Baste with a glass of white wine, reintroduce into oven at 250-degrees F for three additional hours. Raise oven to 500-degrees F and roast for an additional 10 minutes. High-Low-High method: Salt the roll, introduce into oven at 500-degrees F for 40 minutes turning once at the 20-minute mark. Baste with a glass of white wine, then reintroduce into oven at 300 degrees F for one hour. Raise oven to 500 degrees F and roast for an additional 10 minutes. 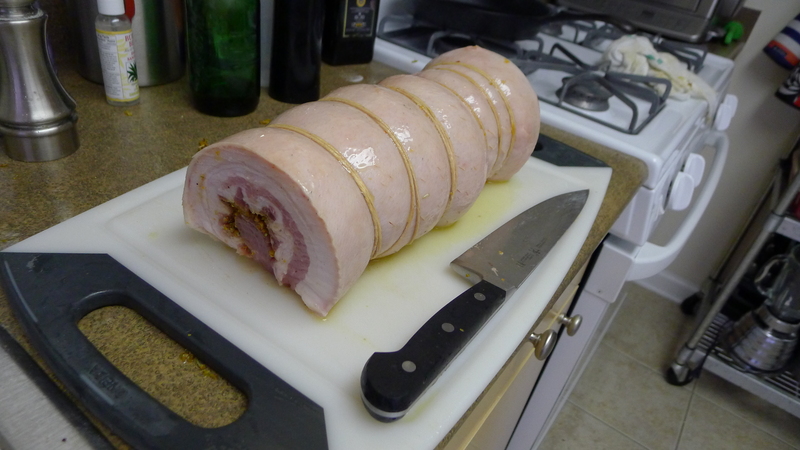 Step-12: Let the Porchetta roll sit for 30 minutes following the above roasting schedule. Slice with a serrated knife and serve. 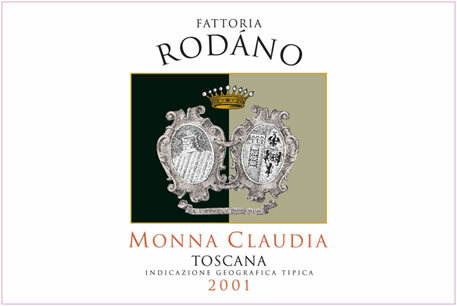 Fattoria di Rodáno’s Monna Claudia: It’s a “Super Tuscan” wine (or any other Super Tuscan with a 50/50 blend of Sangiovese and Cabernet). 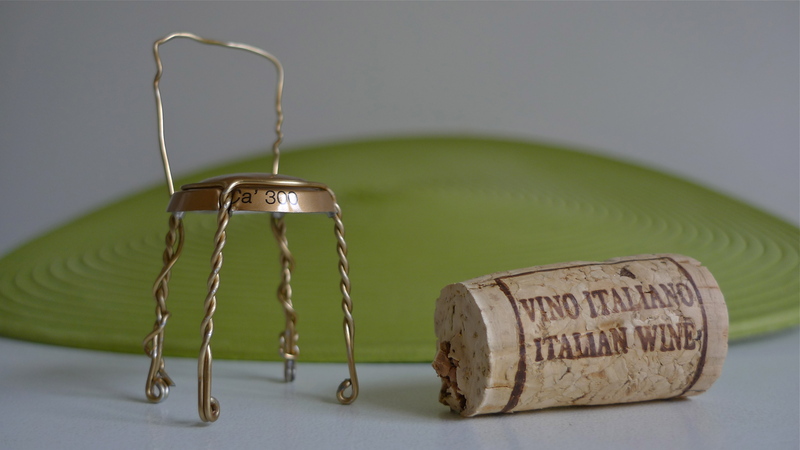 Fattoria di Rodáno is a top source for classically made, user-friendly and complex Chianti. Located in Castellina in the heart of the Chianti Classico district, the estate dates back as a wine-producing property to the 16th century.The Monna Claudia, made only in exceptional vintages of Sangiovese and Cabernet Sauvignon, should be decanted well in advance. At last, I have found the Porchetta made by “Good Chef” Mark Masone. I would like to have it in the near future and to meet Mr. Mark Masone. It’s tailgate season here in the States and the carnivores are always looking for something new to try – this looks fabulous.